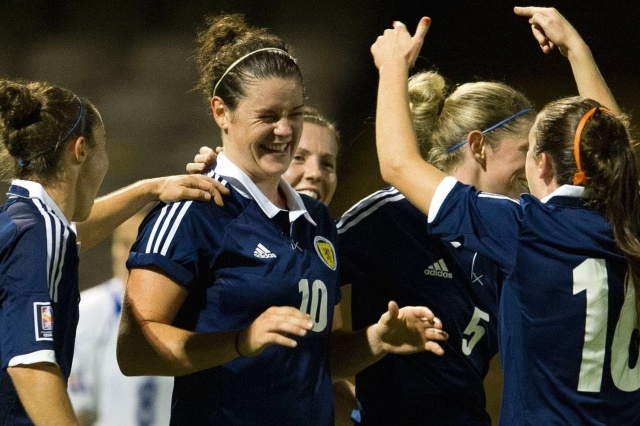 LEAP’s Sirri Topping on the Scotland Women’s National Team receiving funding to train full time. 20/02/17 brought a week where Sirens became Scotland’s first professional netball team, where Scotland Women’s Rugby won their first Six Nations match since 2007 and where Scotland Women’s National Team gained funding to train full-time in the build-up to the UEFA Women’s Euro 2017. With all these positives to take from February, are we beginning to see a new era for Scottish women’s sport? When I was eight my teacher asked the class what we wanted to be when we grew up. As it was during UEFA Euro 2000, football trading cards were a booming playground market and many boys were adamant they would be professional footballers. Although I was confused by the lack of female faces on the cards, in football magazines or on Match of the Day, my passion for football was unwavering, being a footballer was my dream job and I told my class that. A boy laughed, followed by most of the class, even the teacher suppressed a giggle before she swiftly changed the topic. Although these were the same boys I nutmegged on the playground, it appeared I was missing something. Later that night my Dad broke the news, there was no such thing as a professional women’s footballer, my career went up in flames. The blow was somewhat softened by his reassurance that women’s football was a growing sport and that by the time I was old enough, it would be as big as men’s. Granted, I don’t believe my father expected the men’s and women’s game to be on par, however seventeen years on, he did think the gap would be significantly smaller. After years of being spoken over at football matches, being subbed because the opposition was ‘rough’ and having my football knowledge tested because ‘girls know nothing about football’, as a teenager I became slightly disenchanted with the sport. Each Saturday in the stands of my beloved local football club brought a growing sense of alienation from the lack of gender diversity. Notwithstanding this, it was largely a lack of visible female role models that drove me to cut many of my ties to the beautiful game, I could see no final destination which would make the belittlement worthwhile. Looking at the SWNT today, I’m glad that they didn’t let society stand in their way of achieving greatness. Having maintained my participation playing football, I have no illusions regarding the social, physical and mental benefits it brings. Not to undermine the passion, enthusiasm and teamwork evident in women’s football, I have seen a dearth of ambition from many of the women I have played with and against. I’m not saying that money is central to ambition, but I do believe that if players in the top teams were rewarded fairly for the hours of blood, sweat and tears put into being the best they could be, Scottish Women’s Football would look significantly more competitive. The news that the Scotland Women’s National Team will receive funding to train full time on the lead up to this Summers Euros is nothing short of a milestone for the women’s game. Granted money won’t fix all the sport’s problems, but with this investment comes a period of time over which Scottish women are being paid to play. Beyond helping to level the playing field between domestic national players and their teammates who have gone abroad to build a footballing career, this funding aids SWNT in becoming a new generation of role models. It brightens my day to imagine a future where girls can put their hands up and proudly say they want to be a professional footballer without the fear of repercussion. The Scotland Women’s National Team, SSE, sportscotland and Scottish Football Partnership have made me believe this could very well become a reality. Written by Sirri Topping on 8th March 2017. Sirri is a recent graduate of University of Glasgow, focusing her studies on gender and queer equality in sport. She is also a Youth Ambassador for Change with the Scottish FA. This interest stems from many years of participation in sport, particularly football and rugby. Sirri has carried out research projects which have included investigating the differing lived experiences of access to and participation in women's football in Sweden and Scotland, and exploring gender identity among women’s rugby players.